If you have a flea infestation in your home or on your pets, then you want to get rid of them as quickly and as effectively as possible. There are lots of ways to do that, but probably the most direct and potent method to use is to release a flea bomb or flea fogger. These let out a cloud of flea repellent that is incredibly powerful and that can leave behind a chemical residue that keeps fleas at bay for a long time to come. Just be careful that you don’t use this on your pets directly. You could end up causing them health problems and making them sick with the chemicals these products contain. You do want to be careful about which foggers and flea bombs you buy. Not all of them will be equally effective, and some of them can use chemicals that linger too long or that cause harmful effects to you or your pets. Read the directions– Before you buy any flee fogger, you need to read the directions carefully. Make sure it is something that is safe to use in your home, taking into consideration any pets or small children that live there with you. You should only use these products when no one else is around, and then seal up the house and leave it for several hours before returning. That’s just general advice for this kind of flea treatment, but you need to follow the directions exactly with whatever product you end up using. Think of the mess- You should keep in mind that some flea foggers require a lot of cleanup. There are some that will dissipate on their own, and you won’t have to do much cleaning. Others will require mopping, vacuuming and other measures to ensure that all residue is cleaned up. 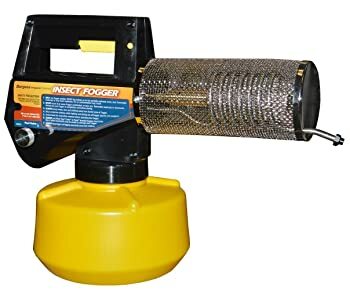 A few of these foggers that take a lot of extra work, and that may not be something you want to deal with. Once again, read those instructions carefully before you make the purchase to ensure that you are choosing something that works well for you. We want to show you the best foggers and flea bombs on the market, to help you make an informed choice about which one to use. This outdoor fogger can work quickly on fleas and other insects, and it lasts for about six hours. If you have managed to cover the entire dwelling area though, it can be effective for far longer than that. The specially designed formula is meant to penetrate areas where conventional bug sprays cannot get, moving through your yard and taking out any hiding pests. 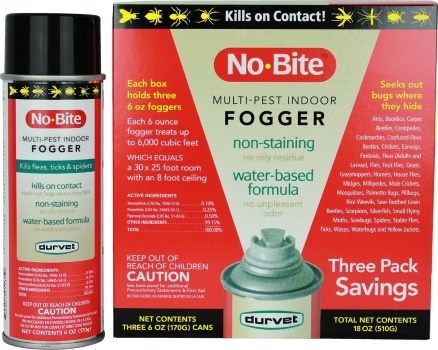 This spray fogger is very effective at getting rid of pests in your home. It is designed to work quickly- effectively killing all small pests in two hours or less. It also leaves behind no harmful residue, so there is no cleanup. It is so effective that it can continue to protect from pests for as long as two months, depending on conditions. This particular fogger may not work effectively on carpets, and you may need to use a spray of some sort if your carpets are infested. It does manage to kill most small insects and other pests, but some customers have reported seeing a few pests hours after they spray the fogger. 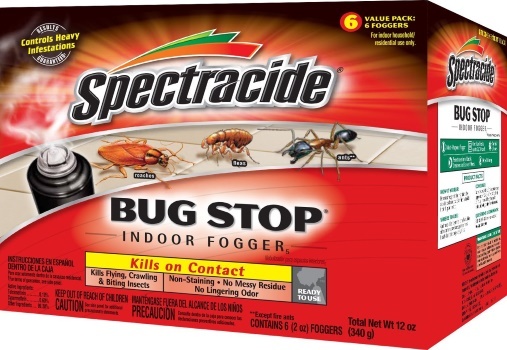 One of the most trusted names in household products brings you this powerful bug killer. It is particularly effective at getting rid of bug eggs, preventing new bugs from hatching for the next few months. You will need to clean everything after you spray this, and you have to leave your home closed up for about three hours, just to ensure that the spray reaches all the pests. In some instances, you may have to use the product multiple times over the course of a few days to effectively kill off all the pests in your home. This should only be for extreme cases where the bugs have been infesting your home for a long time. In most cases, a single application will be enough. 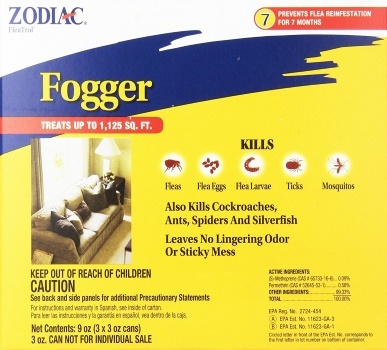 This fogger is designed specifically for fleas that dwell around pets, so it is one of the better ways to prevent them from infesting your home or your pets. It not only kills fleas, but it takes out their hatching eggs as well. 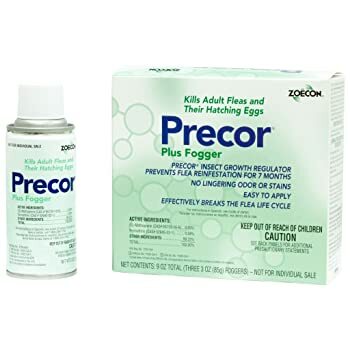 You should not see any more fleas for up to seven months after using this fogger. This is one is considered one of the best on the market. If you use Adams flea fogger, you can get rid of far more than just fleas. Ticks, ants, spiders and more should all fall to its powerful fog clouds. It keeps your home protected for up to seven months as well, and it is designed to not stain your home. That means there shouldn’t be a lot of cleanup for you to do afterwards. Using the FMC fogger, you can get rid of a large variety of pests, including fleas, cockroaches, weevils, spiders, moths and more, and you’ll be able to keep them away for at least 30 days. 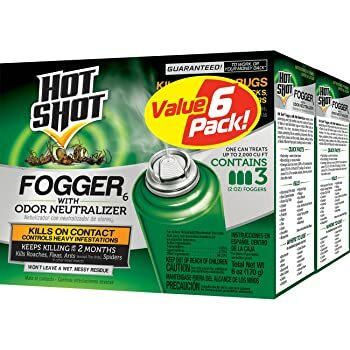 This fogger is meant to leave a residual chemical trace that keeps insects and other pests at bay for an entire month. It has been approved for use in areas close to food, so there isn’t a lot of cleaning that needs to be done afterwards. 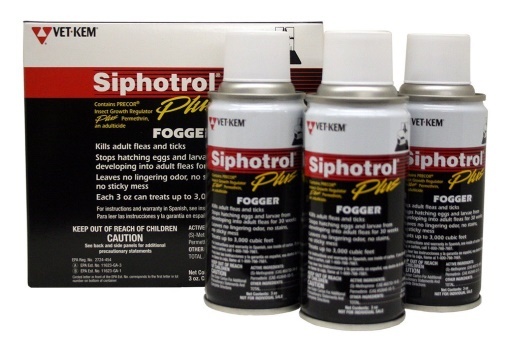 Designed not to leave behind any sticky residue and be easy to clean up afterwards, this fogger is great at killing fleas and their eggs. It comes with three cans, so you get a lot value for your money. There have been reports of cans going off in the box and being empty by the time they are opened, so consumers should buy at their own risk. 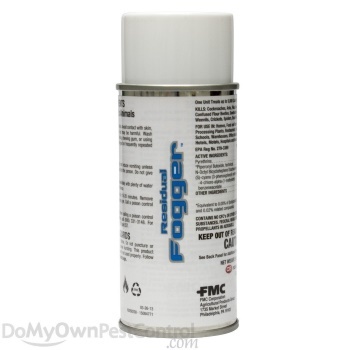 This is another fogger that won’t leave anything sticky behind for you to clean up later. It is designed to kill far more than just fleas, taking care of cockroaches, spiders, silverfish and ants. Like several others on this list, it manages to keep your home free from pests for as long as seven months, though the conditions in the home can cause the actual effectiveness window to vary. Unlike some other products on this list, you can use this spray and then return to your home within as little as two hours. It works fasts and dissipates quickly, allowing you to get back home faster than most other foggers would. Because of the fast-acting formula, if you have a large house, you may want to spray multiple cans, particularly if you have high ceilings, as the fog will settle quickly. This is designed for a small, single room, and if you need to cover more area than that, then you will need to get some more cans of fogger. 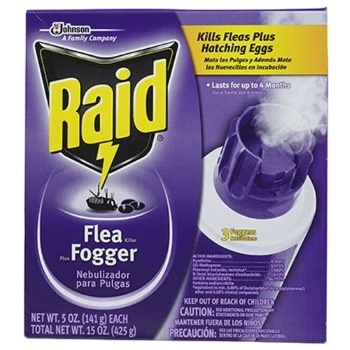 However, with this fogger, you can get rid of all sorts of pests, and not just the fleas. It won’t leave you with an unpleasant odor, and it is able to work in just about any environment. You can use it outdoors as well as inside your house. 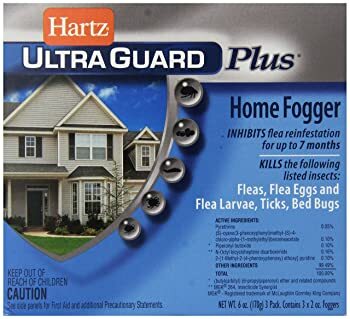 Like the very best foggers on this list, Hartz will keep the bugs away for as long as seven months. Of course, the kind of environment in your home will determine how effective it is and how long it lasts, but you can rest easy knowing that you won’t have to deal with the pests for a long time. It gets rid of pests that you can’t see, preventing them from coming back and eliminating flea eggs. Only people who’ve endured flea infestations will understand how horrible such an intrusion can be, and to what lengths you’d be willing to go to get rid of it. Luckily, there are a few treatment options that will do the job well. Whether you need a powerful, more chemical-based flea killer to treat your house or some outdoor area right next to it, or just need a light spray around the house to keep things in check, one of the products listed above will do. Just be sure to use it according to instructions and on a regular basis, so as to catch all those fleas that escaped the first treatment. That way, you will enjoy a flea-free home for years to come.